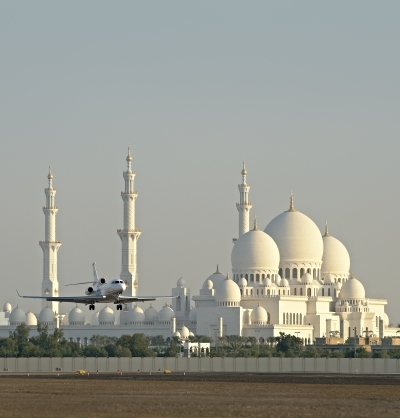 Jane Stanbury has been on her travels again, this time to Dubai for the airshow. Here is her comprehensive report. Record breaking deals, bag-pipe playing police, stunning air displays and a light helicopter with an ejectable cabin were just some of the highlights at this year’s Dubai AirShow. Visitor numbers were up on 2009 levels with a footfall of 56,548 and nearly 1,000 exhibitors, making the 12th edition of the show its biggest yet. Halls, pavilions and chalets displayed the colours of the UAE national flag in celebration of the nation’s 40th anniversary. Celebrations came to a climax as the new aerobatic display team, Al Fursan, made its debut, opening the aerial display with a fly-past alongside an Emirates Boeing 777 aircraft, proudly trailing the colours of UAE national flag to the delight of the crowd. But it wasn’t just the locals celebrating. An historic order from Emirates for 50 Boeing 777-300ERs (Extended Range) plus options for an additional 20 of the twin-aisle commercial jetliner was valued at $18 billion, representing Boeing’s largest order ever. The 787 Dreamliner which stood majestically over the static display, made its debut in the region and an order for six from Oman Air followed swiftly. There were wins for the Airbus A320neo too – from US Florida-based Spirit Airlines and an MoU for 75, 45 A320neo (new engine option) and 30 A320s aircraft. The MoU should be converted into a firm order by year end, a deal valued at U$7bn. Even the antics of Al Akbar, CEO of Qatar Airways couldn’t dampen the atmosphere. Whilst decrying Airbus for “not knowing how to build aircraft,” his subsequent order for 50 A320neo aircraft and five A380s, totted up a list price spend of $6.4bn. Aircraft yet to fly also featured as the stylish dome enclosed cabin mock-up of the C Series formed the backdrop to the announcement that Turkey’s Atlasjet had signed an LoI to purchase 10 CS300 jetliners, plus options on a further five. The list price for the firm order is estimated at $776m, and could increase to $1.18bn if the five options are converted. In total at the close of the show $63.3bn worth of orders for aircraft, maintenance services and flight training programmes had been confirmed. Business aviation was a strong element of the show, and there was quiet confidence amongst players in the sector. Reflecting the burgeoning growth, Al Bateen, the region’s only dedicated executive airport, saw a 58% increase in business aviation movements during the F1 finales which coincided with the first day of the Airshow. Steve Jones, General Manager said “Our newly launched DhabiJet FBO service ensured that during the airport’s busiest period clients and crew had access to some of the most modern and efficient FBO facilities anywhere in the world. ” A pre-show round table hosted by the Middle East Business Aviation Association demonstrated that the market has huge potential – see report opposite. ExecuJet Aviation Group announced it would be the first aviation company to offer integrated financing with a new product called SimplyFly. It aims to make ownership easier through a turnkey package that it hopes will appeal to those who until now stayed away from jet ownership in order to avoid the complexity of aircraft financing. ExecuJet also announced it was setting up an FBO in Jeddah, Saudi Arabia and Gama Aviation, headquartered in Farnborough, UK announced it was expanding its ME activity with the opening of an aircraft management and charter base in Jeddah, in partnership with Imitiaz Company for Aviation Services LLC. “This is a significant announcement for Gama, now in its 29th year and is the culmination of a substantial period of planning and negotiation,” said Gama CEO Marwan Khalek. 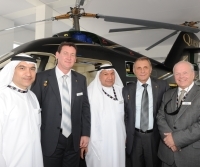 The VLJ Eclipse, with fresh backing from Sikorsky, featured on the static, and the company announced commitments and contracts for five Total Eclipse aircraft to customers who will register their aircraft in the UAE. Executive Vice President EMEA, Ekim Alptekin said, "many assumed the UAE was an unlikely market for an efficient jet like the Total Eclipse. We are proud to prove them wrong. 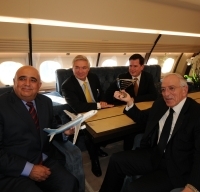 With these orders, UAE businessmen are proving that they care about efficiency.” Other executive aircraft on the static included Comlux’s ACJ318, with the Swiss-based company also declaring its first-ever order for an Airbus ACJ321. Gama Aviation announced an ACJ318 had just joined its fleet, becoming the largest aircraft in the company’s Middle East fleet and for Gama globally, its 11th manufacturer type. The Qatar Executive Global 5000 also generated interest as CEO Akbar Al Baker was inducted into the Hall of Fame at the annual Aviation Business awards, recognising his dynamic leadership in steering the aggressive expansion of Qatar Airways. Outside of the orders the theme of flight training permeated this year’s show and continued on the final day with the signing by Fujairah Aviation Academy in the UAE with IATA, to develop the facility as an IATA-approved training centre for high school graduates. Ayla training centre also had a strong presence. It is encouraging pilot candidates to train at its JAA approved facility in Jordan before finishing their training in the UK (Coventry Airport). Whilst 2011 Dubai Airshow was about consolidating, large orders and the latest technology, 2013 is destined to be a platform for exploring the future development of the region’s aviation industry.